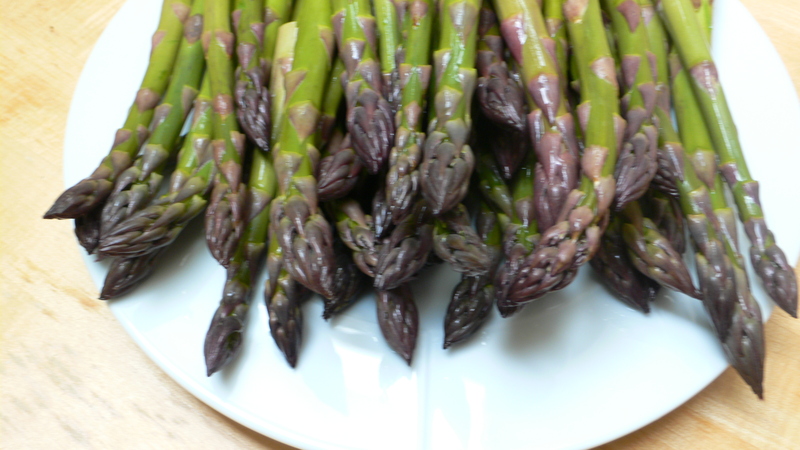 Prepare asparagus by washing and snapping off tough bottoms. Cut off asparagus tips and reserve, to add to soup at the end. Chop (medium coarse) 2 spring onions. In an 4 qt. all-clad sauce pan, saute onions in 2 tablespoon butter for 5 to 7 minutes until soft. Stir in 2 tablespoon flour and saute another 5 minutes. Add tough bottoms and fresh thyme to pan and saute 5 to 7 minutes, stirring to prevent browning. When aparagus begins to soften add about 8 cups of freshly made hot chicken stock. Bring back to a boil and simmer for about 20 to 30 minutes. To finish soup, blend with a hand held stick blender for five minutes until coarsely smooth. Strain through a fine sieve and bring back to a low simmer. Add raw tips and simmer lightly for 5 more minutes until asparagus tips soften but are still firm. that is a good recipe! Mummmm. can’t wait to try it!